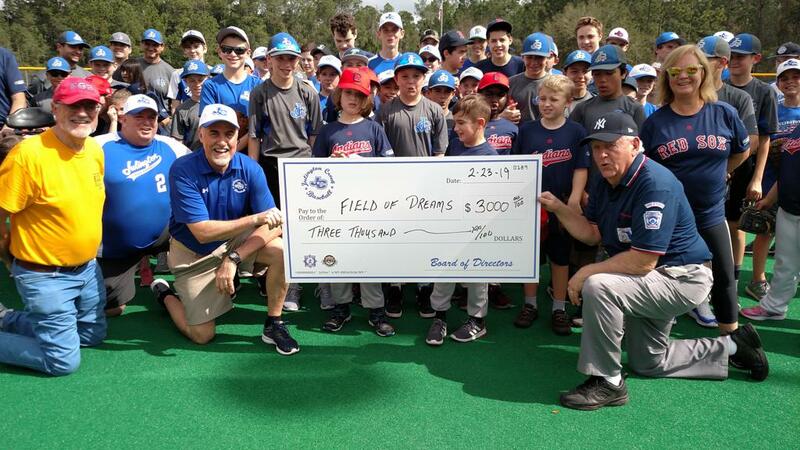 On Saturday, February 23rd, Julington Creek Baseball actively participated at the Field of Dreams at Aberdeen Park. The Field of Dreams league provides an opportunity for children with special needs, whether they are physical, developmental or emotional, to play America’s pastime. Ten JCB spring teams between the ages of 11U and 18U participated, including approximately 100 players and coaches. Some players were participating for the 1st time and others were back for their 3rd and 4th time. In between games, JCB presented Field of Dreams with a check for $3,000. The money will go towards their newest playground project that is scheduled to break ground later this month. George Vancore and Gene Kolisnyk accepted the check on behalf of the FOD. Special thanks goes to Mr. Paul Chouinard, JCB Babe Ruth Director, for coordinating JCB’s participation!